This lovely fully signed copy of With The Beatles is going into our auction next August! Unfortunately not one signature is by an actual Beatle. Demand for Beatles autographs was high and quite a lot of the time someone else signed for them. In this case all four Beatles signatures are by their road manager Neil Aspinall. 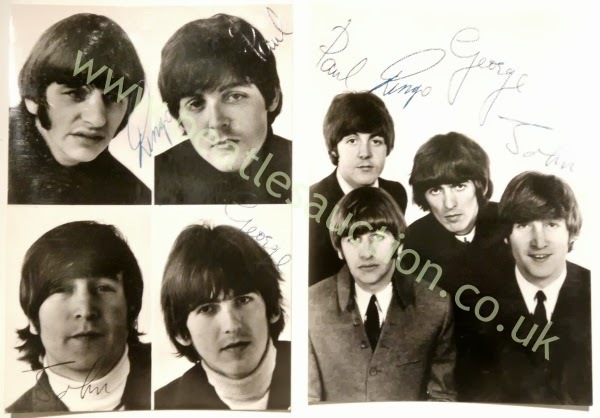 Bizarrely the "fakes" do have a value depending on who did them and because Neil was such a high profile member of the Beatles entourage we are hoping this set will reach between £250 and £350 for the vendor. Nowhere near the price of a genuine set, but they will still look good framed up and on the wall. On the subject of things not signed by the Beatles that look good on the wall, the Fan Club photos below all feature printed signatures. We see these a lot. The way they were done makes it look like there's a pen imprint on the the card, but sadly they aren't the real deal. The cards shown will be part of a lot with a few other items in our auction, individually the cards are worth around £10 each. We never give out valuations on autographed items without seeing them first. If you have signed items you want looked at you can send us scans or photographs via our contacts page. Please make sure the images are as clear as possible. Or you can bring them into the shop, please ring us first to make sure that Stephen is available when you visit as he is the person who does all the valuations.